Insider Tips for Visiting COSI--the Country's Number 1 Science Center! 1. Movies are always better in 3D! Check out a dinosaur roaring right in your face or a giant wave that looks like it’s about to come crashing down on you in our new digital giant screen theater. See Waking the T.Rex: The Story of SUE in heart-pounding 3D or wonder why you aren’t soaked after seeing The Ultimate Wave: Tahiti in 3D. 2. Next time you see fireworks, you’ll have a whole new outlook when you find out the “Science of Fireworks.” Find out how fireworks blow up, how they launch into the air and how they get their pretty colors. And with a grand finale of colorful explosions, you’re sure to have a great time! Runs daily this summer at COSI. 3. Sometimes science gets messy and who wants to clean that up? We do! Check out Messy Science Day on July 4. It’s all things squishy, squirty and downright gooey! Learn all about our favorite messy science experiments and demonstrations. 4. Who else parks giant farm equipment out on the riverfront so you can learn all about the science behind them? COSI of course! Come see big farm equipment August 17 – 21, 2011. 5. Dinosaurs! 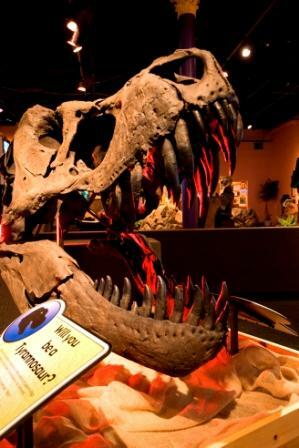 All summer long you can see our colossal creatures “come to life” through animatronics, find your inner paleontologist with our 3,000 square foot maze testing your knowledge of the prehistoric and “be the dinosaur” in one of our exclusive interactive simulator pods! And don’t forget to take advantage of the awesome Kids Eat FREE Summer Getaway Package that the Dublin Convention and Visitors Bureau has going on this summer! Not only do you get discounted passes to the #1 Science Center in the country and the Columbus Zoo, but kids eat free AND you get to hang out in one of central Ohio’s real gems – Dublin! Visit cosi.org or call 614.228.COSI for more information. ~Jaclyn Reynolds, Public Relations and Social Media Manager COSI.